OK so as I promised my Twitter and Facebook followers that there would be a post today all about as the title might suggest Terraclips. 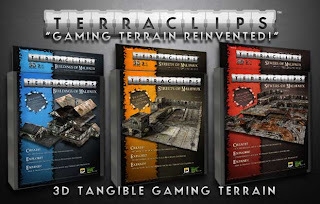 Terraclips is a modular board system made by WorldWorks Games in corroboration with Wyrd Miniatures. Terraclips uses sturdy card with very high detailing on either side. It comes in pieces not disimilar with a puzzle. These are clipped together using a clip in one of three style I, T or L depending on the build. The system is designed to build a 3D board with levels that can be removed on the fly to enable a game to utilise all areas of the board be they in a house or even in an atic, just move the roof or level you need to have out of the way and continue playing. The clips and tiles are supplied separately and it is clearly stated on the box. There are three different boxes currently available Streets, Sewers and Buildings of Malifaux. All the boxes come with plenty of pieces and enough to comfortably build a 1.5ft square board with a second level (that is one box of Terraclips and one box of Clips). Three sets of any box and 3 sets of clips will build a 3x3 board (the size needed for Malifaux) with a few levels and still have parts to spare. Clips - Now love them or hate them they are necessary, but, they are an absolute eyesore. Even worse if you plan on taking pictures of your board (once you eventually build it). Now don't get me wrong they are better than the original clips but still need some work...maybe a clear plastic would be better? Time - If you want to play a quick game this is not the board system for you! I have built a few now and have reduced my time to about one hour for a 2x2 multi-level board. Sadly there is no way to remedy this other than practice. Inch Markers - As a miniature wargamer this are a bane in my games as there is no need to pre-measure and take that judgement out of a game for me. I can see there use in a Role Playing Game but not in a game of Malifaux. Well they are my two main gripes with the Terraclips system. Sturdiness - The card is very sturdy and deceptively strong (I had a Steamborg Executioner on the very edge of an unsupported tile and it held with very little drop). Once clipped to a few more tiles and with the right amount of lower supports this only increases. Quantity - The amount you get in each box frankly astounds me. Even after building a 3x3 board i had plenty left and if I had more clips I could have probably added either a few more levels or a couple more feet to the base level. Attention to detail - There is plenty of detail on each and every tile even down to removable doors and markers for in game use. The sizes of them could even be used on bases (if you really wanted to save time and just glue one as an insert). Cost - For what you get and the amount of it, you really cant go wrong with purchasing this. Time for some pictures of my current build, a 2x2 board which took approximately one hour to build. They are all the levels that make up my 2x2 board that is build ready for a demo coming up. That is the table in its glory. As you can see the clips show up terribly under a camera flash but in reality you do grow used to them. This is all the extra parts I had left after building the board. They are all elastic banded together in their sizes and shapes to ease finding them for building further boards. To summarise on this system, I think for a gamer they are a fantastic investment for the price and use of them. Okay you wont use them every game but if you have an hour beforehand to build a table it will give you a great backdrop to your games and can really help set the scene. There are some flaws in the system granted (mainly the clips) and over time I'm sure these will be ironed out. With careful planning you wont use as much clips for games and your build time will reduce dramatically. Once again thanks for your time and if you wish to see more about this system why not check out their official website www.terraclips3d.com.